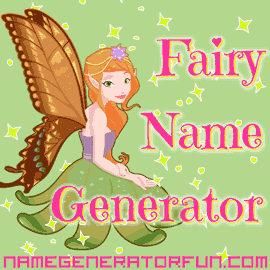 The Original Fairy Name Generator - Cute, Magical Family Fun! The Original Fairy Name Generator - for Magic and Glitter! Do you believe in magic? Are you mischievous and playful? Would a pair of gossamer wings look really good on you? If so, then give into your enchanted destiny with the original fairy name generator! This page is probably the second name generator ever published on the internet. It has been online since Emma created it in 1999 when she made it to teach herself how to code. At the time she was thinking of Tinker Bell from Peter Pan, so she designed the names to be funny, whimsical, romantic, and pretty. She wanted them to summon up a feeling of enchantment and wonder, but also to be cute and sweet. The descriptions are inspired by the beautiful fairy paintings of Cicely Mary Barker, whose flower fairies wear leaves, moss, petals, and bell-shaped flowers as hats. They have titles like "The Sweet-Pea Fairies," "The Almond Blossom Fairy," and "The Christmas Tree Fairy." The fairies in the generator have individual appearances with their own style of clothing and pretty coloured wings like butterflies, moths, and dragonflies. The fairy in Shakespeare's The Tempest is called Ariel. We we think Ariel would make a beautiful name for a baby girl, even though the original character was a boy. Shakespeare also mentions a fairy called Queen Mab in Romeo and Juliet, who he describes as the fairies' midwife, who helps sleepers give birth to their dreams. In A Midsummer Night's Dream, the fairy king and queen are called Oberon and Titania. The play also features a fairy character called Puck, or Robin Goodfellow, and minor characters Peasblossom, Cobweb, Moth, and Mustardseed, who are fairy servants to Titania. You will see echoes of these names in our generator! In the Disney version of the fairy tale Sleeping Beauty, the wicked fairy queen is called Maleficent, although the Disney film titled Maleficent starring Angelina Jolie suggests she was misunderstood! The film Legend, starring a young Tom Cruise, featured a fairy called Oona, which is an Anglicization of an old Irish and Scottish Gaelic name, Una or Oonagh, which means lamb. Una is also the name of a fairy queen. She is the last High Queen of the Daoine Sidhe in Irish fairy folklore. The Sidhe and also the legendary Tuatha Dé Dannan (people of the fairy goddess Dana or Danu) of Irish folklore, are sometimes thought to be gods and sometimes thought to be fairy folk. The Tuatha Dé Dannan were led by a fairy king called Nuada who was injured in a great battle and had his arm replaced with silver. Celtic and Gaelic names are favourites for fairy characters, as the UK has a rich history of fairy mythology. In Welsh mythology Gwyn ap Nudd is the king of the Tylwyth Teg or "fair folk" and the ruler of the Welsh Otherworld. In Arthurian legend, Morgan Le Fey, or Morgan of the Fairies, is a powerful enchantress who is a sometime enemy of King Arthur, whilst Olwen is the beautiful daughter of Ysbaddaden the Giant. In a tale originating in Norfolk, Tam Lin is a mortal man who has been captured and enchanted by a beautiful fairy woman - the queen of the fairies. We think Tam would make a great name for a baby boy. Fairies are also associated with the Nerida (sea nymph) and the Naida (water nymph) in Greek mythology. In German and Celtic mythology they are associated with the Nyx and Nixie (water sprite). Some fairies just have titles instead of names, for example, in Cinderella, the fairy is just called "The Fairy Godmother." The fairy in Pinocchio is simply called The Blue Fairy or "The Fairy with Turquoise Hair." In Jonathan Strange and Mr Norrell by Susanna Clarke, the wicked male fairy is given the title "The Gentleman with Thistle-Down Hair." Sometimes a name can be a matter of life and death! In the tale of Rumpelstiltskin, an imp extracts a promise from a poor miller's daughter to give up her first-born child to him if he spins straw into gold to save her life. The king marries her and when gives birth to her first child Rumpelstiltskin comes to collect, but he consents to give up his claim if she can guess his name within three days. On the third day she wanders in the woods searching for him and comes across his mountain hideaway, and hears him gloating, dancing around his fire and singing, "Tonight tonight, my plans I make, tomorrow, tomorrow, the baby I take. The queen will never win the game, for Rumpelstiltskin is my name!" When she guesses his real name, he stamps his foot so hard in rage that he creates a chasm and falls through the floor. Fairies have a reputation for mischief and trickery. Old Celtic myths about fairies suggest they can be spiteful if you cross them, but children's fairy tales suggest they are also kind and sweet to innocents who are in need of help or who have lost their way in the wilderness. Fairies are also said to be very elusive and hard to see. They are sometimes described as only being visible in the light of the full moon, as they dance around fairy rings of toadstools. Unwary travellers who stumble across these fairy gatherings can become enchanted by the singing of the fairies and drawn into the fairies' world. Such intruders are brought before the fairy queen for magical punishments or sometimes even marriage! Last Updated: 12th January 2019. Image Credit: Fairy designed by Ddraw. Licensed under CC BY 3.0.